Not to be confused with Inequation. "Less than" and "Greater than" redirect here. For the use of the "<" and ">" signs as punctuation, see Bracket. For the Nine Inch Nails song, see Less Than (song). For the UK insurance brand "MORE TH>N", see More Than (company). 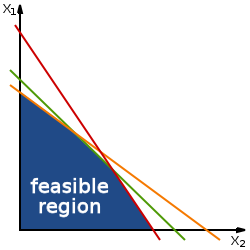 The feasible regions of linear programming are defined by a set of inequalities. If the values in question are elements of an ordered set, such as the integers or the real numbers, they can be compared in size. In either case, a is not equal to b. These relations are known as strict inequalities. The notation a < b may also be read as "a is strictly less than b". The notation a ≫ b means that a is much greater than b.
Inequalities are governed by the following properties. All of these properties also hold if all of the non-strict inequalities (≤ and ≥) are replaced by their corresponding strict inequalities (< and >) and (in the case of applying a function) monotonic functions are limited to strictly monotonic functions. If a ≥ b and b ≥ c, then a ≥ c.
If a ≤ b and b ≤ c, then a ≤ c.
If a ≥ b and b > c, then a > c.
If a > b and b ≥ c, then a > c.
If a = b and b > c, then a > c.
If a > b and b = c, then a > c.
If a ≤ b, then b ≥ a. If a ≥ b, then b ≤ a. If x < y, then x + a < y + a. If a ≤ b, then a + c ≤ b + c and a − c ≤ b − c.
If a ≥ b, then a + c ≥ b + c and a − c ≥ b − c. i.e., the real numbers are an ordered group under addition. If x < y and a > 0, then ax < ay. If x < y and a < 0, then ax > ay. If a ≥ b and c > 0, then ac ≥ bc and a/c ≥ b/c. If a ≤ b and c > 0, then ac ≤ bc and a/c ≤ b/c. If a ≥ b and c < 0, then ac ≤ bc and a/c ≤ b/c. If a ≤ b and c < 0, then ac ≥ bc and a/c ≥ b/c. More generally, this applies for an ordered field; see #Ordered fields. If a ≤ b, then −a ≥ −b. If a ≥ b, then −a ≤ −b. If a ≤ b, then 1/a ≥ 1/b. If a ≥ b, then 1/a ≤ 1/b. If a < b, then 1/a < 1/b. If a > b, then 1/a > 1/b. If 0 < a ≤ b, then 1/a ≥ 1/b > 0. If a ≤ b < 0, then 0 > 1/a ≥ 1/b. If a < 0 < b, then 1/a < 0 < 1/b. If 0 > a ≥ b, then 1/a ≤ 1/b < 0. If a ≥ b > 0, then 0 < 1/a ≤ 1/b. If a > 0 > b, then 1/a > 0 > 1/b. Any monotonically increasing function may be applied to both sides of an inequality (provided they are in the domain of that function) and it will still hold. Applying a monotonically decreasing function to both sides of an inequality means the opposite inequality now holds. The rules for the additive inverse, and the multiplicative inverse for positive numbers, are both examples of applying a monotonically decreasing function. If the inequality is strict (a < b, a > b) and the function is strictly monotonic, then the inequality remains strict. If only one of these conditions is strict, then the resultant inequality is non-strict. The rules for additive and multiplicative inverses are both examples of applying a strictly monotonically decreasing function. a ≤ b ⇔ an ≤ bn. a ≤ b ⇔ a−n ≥ b−n. a ≤ b ⇔ ln(a) ≤ ln(b). a < b ⇔ ln(a) < ln(b). This is true because the natural logarithm is a strictly increasing function. 0 ≤ a and 0 ≤ b implies 0 ≤ a × b. Note that both (Q, +, ×, ≤) and (R, +, ×, ≤) are ordered fields, but ≤ cannot be defined in order to make (C, +, ×, ≤) an ordered field, because −1 is the square of i and would therefore be positive. The non-strict inequalities ≤ and ≥ on real numbers are total orders. That is, given arbitrary a, b ∈ R, at least one of a ≤ b and b ≤ a holds; at the same time, at least one of a ≥ b and b ≥ a holds. The strict inequalities < and > on real numbers are strict total orders. That is, < on R has trichotomy property: given arbitrary a, b ∈ R, exactly one of a < b, b < a and a = b is true; likewise, > on R has the trichotomy property. 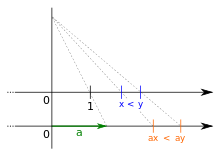 The notation a < b < c stands for "a < b and b < c", from which, by the transitivity property above, it also follows that a < c. By the above laws, one can add or subtract the same number to all three terms, or multiply or divide all three terms by same nonzero number and reverse all inequalities if that number is negative. Hence, for example, a < b + e < c is equivalent to a − e < b < c − e.
This notation can be generalized to any number of terms: for instance, a1 ≤ a2 ≤ ... ≤ an means that ai ≤ ai+1 for i = 1, 2, ..., n − 1. By transitivity, this condition is equivalent to ai ≤ aj for any 1 ≤ i ≤ j ≤ n.
When solving inequalities using chained notation, it is possible and sometimes necessary to evaluate the terms independently. For instance, to solve the inequality 4x < 2x + 1 ≤ 3x + 2, it is not possible to isolate x in any one part of the inequality through addition or subtraction. Instead, the inequalities must be solved independently, yielding x < 1/2 and x ≥ −1 respectively, which can be combined into the final solution −1 ≤ x < 1/2. Occasionally, chained notation is used with inequalities in different directions, in which case the meaning is the logical conjunction of the inequalities between adjacent terms. For instance, a < b = c ≤ d means that a < b, b = c, and c ≤ d. This notation exists in a few programming languages such as Python. An inequality is said to be sharp, if it cannot be relaxed and still be valid in general. Formally, a universally quantified inequality φ is called sharp if, for every valid universally quantified inequality ψ, if ψ ⇒ φ holds, then ψ ⇔ φ also holds. For instance, the inequality ∀a ∈ ℝ. a2 ≥ 0 is sharp, whereas the inequality ∀a ∈ ℝ. a2 ≥ −1 is not sharp. A "power inequality" is an inequality containing terms of the form ab, where a and b are real positive numbers or variable expressions. They often appear in mathematical olympiads exercises. In the limit of p → 0, the upper and lower bounds converge to ln(x). This inequality was solved by I.Ilani in JSTOR,AMM,Vol.97,No.1,1990. This inequality was solved by S.Manyama in AJMAA,Vol.7,Issue 2,No.1,2010 and by V.Cirtoaje in JNSA, Vol.4, Issue 2, 130–137, 2011.
if 0 ≤ a and 0 ≤ b, then 0 ≤ a b. It can easily be proven that for this definition a ≤ b implies a + c ≤ b + c.
. We note that this notation is consistent with that used by Matthias Ehrgott in Multicriteria Optimization (see References). , there exists no valid inequality relationship between these two vectors. Also, a multiplicative inverse would need to be defined on a vector before this property could be considered. However, for the rest of the aforementioned properties, a parallel property for vector inequalities exists. , and A is a matrix. This has a solution, for example, when there is at least one positive element on the main diagonal of A. Systems of inequalities can be written in terms of matrices A, B, C, etc., and the conditions for existence of solutions can be written as complicated expressions in terms of these matrices. The solution for two polynomial inequalities in two variables tells us whether two conic section regions overlap or are inside each other. The general solution is not known, but such a solution could be theoretically used to solve such unsolved problems as the kissing number problem. However, the conditions would be so complicated as to require a great deal of computing time or clever algorithms. Murray S. Klamkin. "'Quickie' inequalities" (PDF). Math Strategies. Arthur Lohwater (1982). "Introduction to Inequalities". Online e-book in PDF format. "3rd USAMO". Archived from the original on 2008-02-03. Pachpatte, B. G. (2005). Mathematical Inequalities. North-Holland Mathematical Library. 67 (first ed.). Amsterdam, The Netherlands: Elsevier. ISBN 0-444-51795-2. ISSN 0924-6509. MR 2147066. Zbl 1091.26008. Ehrgott, Matthias (2005). Multicriteria Optimization. Springer-Berlin. ISBN 3-540-21398-8. Steele, J. Michael (2004). The Cauchy-Schwarz Master Class: An Introduction to the Art of Mathematical Inequalities. Cambridge University Press. ISBN 978-0-521-54677-5. Wikimedia Commons has media related to Inequalities (mathematics). Graph of Inequalities by Ed Pegg, Jr., Wolfram Demonstrations Project.